Spot-The-Health-and-Safety-hazards cartoon. 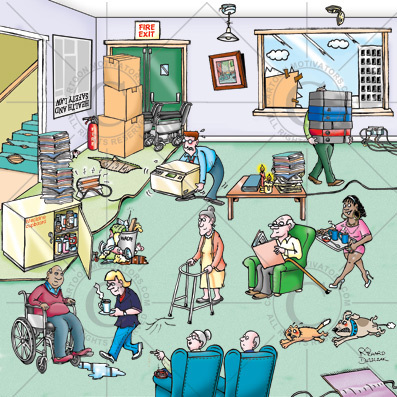 Care Home cartoon with health and safety hazards. Heath and safety hazards cartoon. Hazards in a care home environment. Spot the health and safety hazards cartoon. Numerous health and safety hazards illustrated in a cartoon. Health and safety cartoon for training purposes - ask your staff how many hazards they can spot? Some of the health and safety hazards include: Blocked fire exit, health and safety law poster upside down, ripped carpet, light fitting unsafe, smoke alarm without battery, guy carrying big boxes not seeing trip hazard, overloaded socket, over flowing waste bin, smoking hazard, trip hazard over out stretched walking stick, care home assistant in really high heels, broken window patched up, wire going under mat, pool of water on floor. Nearly 30cm square in size. Ideal for training staff/colleagues to be more safety conscious.